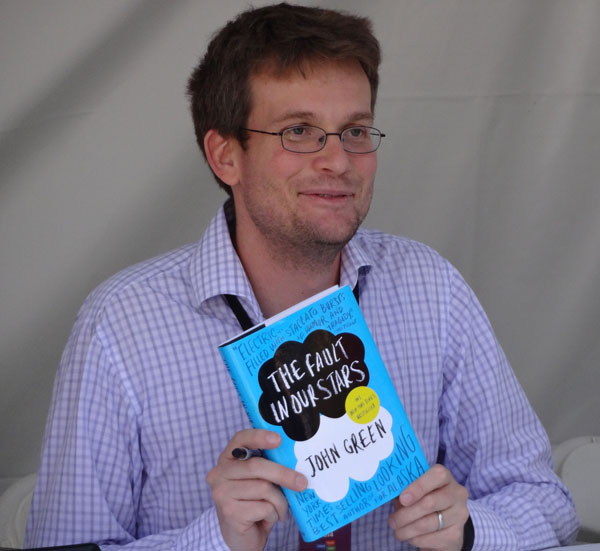 Reading John Green’s books has made me a better writer, possibly even a better person. And so, when I found out that he would be participating in a Conversation (Q and A session) at the 2014 Los Angeles Times Festival of Books, I hoped that I would get the chance to meet him. About a week beforehand, as soon as tickets to John Green’s Q and A session became available, I sat at my computer, refreshing the ticket order form over and over until I was able to get tickets; the tickets sold out minutes later. 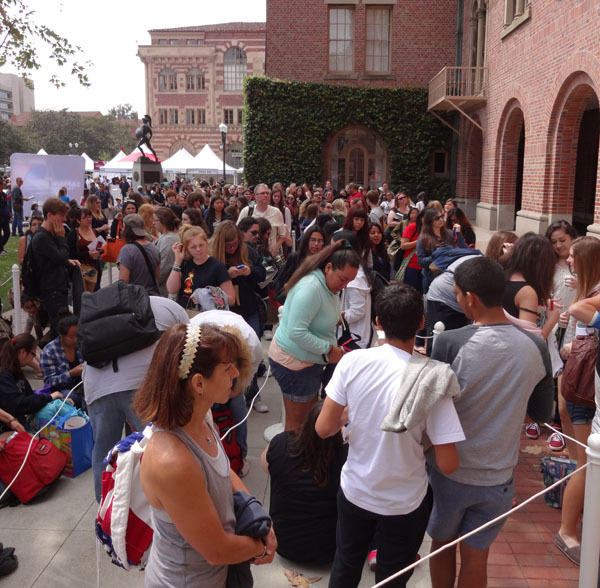 At the festival, I waited in line for over an hour hoping to score good seats for the Q and A. The time flew by thanks to conversation with the John Green fans waiting with me, like fellow author and reporter, Lorie Lewis Ham, who was covering the festival for Kings River Life Magazine. But all this felt worth it once I was sitting in a packed auditorium full of excited energy, listening to John talk about his work, his characters, and his thoughts about the world in general. I’d seen John on YouTube, but there is something about seeing someone in person that I feel is very revealing about their personality. John seemed honest and humble, two qualities that I really like in a person. John shared that he often injects his real-life experiences into his books, for example, like Miles “Pudge” Halter in Looking for Alaska, John went to boarding school, and a friend of his died unexpectedly while he was there. The line, “Imagining the future is a kind of nostalgia,” in Looking for Alaska was something that his future wife said to him on a date. When it was my turn to ask a question, I bravely stepped up to the microphone. My heart pounded ferociously in my chest. 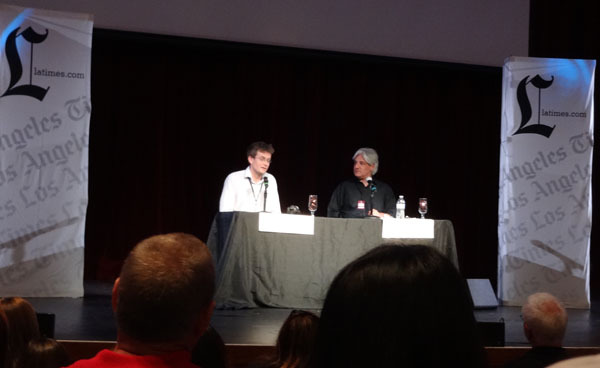 It was my chance to meet John Green, and it was about to happen in front of hundreds of people. Then he moved on to the next questioner, and I went back to my seat where the reality of our very brief meeting finally sank in. I wish I’d told John how much he’d inspired me. I wish I’d said thank you. And so, John, if you’re reading this, thank you for inspiring me! And I hope you get that special time with Hank! 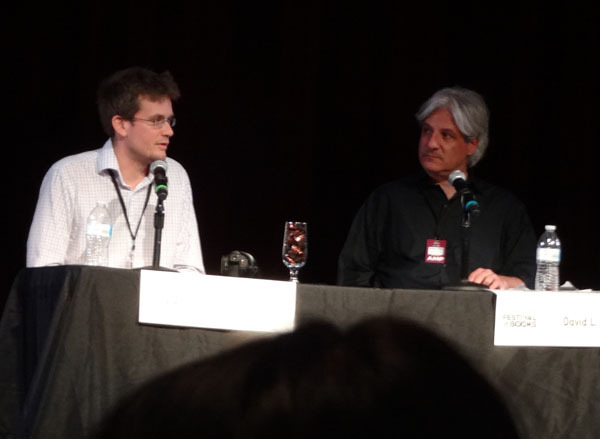 I met John Green (Author of The Fault in Our Stars, Looking for Alaska, Paper Towns, An Abundance of Katherines, and Will Grayson, Will Grayson) on April 12th, 2014, at the Los Angeles Times Festival of Books.